Gosh! The shoot we are going to share with you today will have you pinning all over the place! One of my favourite parts of a wedding is checking out how a bride wears her hair and makeup. As most women will know it is so important to comfortable with your look on your wedding day. 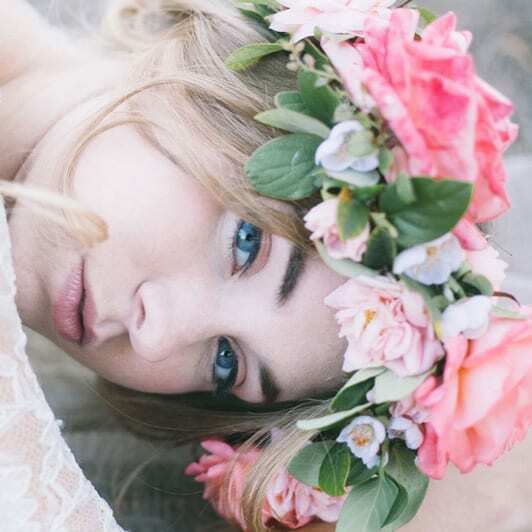 Photographer Alexandra Wallace worked closely with talented California florist Laurel White and hair and makeup artist Ana Garcia Cheadle to capture all the aspects of nature, colour, contrast and texture to create this unbelievably pretty and ethereal styled beauty shoot, focusing on makeup that looks soft and natural, perfect for your wedding day. I am in love, the photography and styling is just so dreamy! Makes me excited that spring is just around the corner!